At Autodesk University there was a lot of talk about “Vespa” but it didn’t refer to cute little Italian scooters (right). What is Vespa? An “application concept” being previewed at AU. This is not a product, or even a beta, and the presentation was subject to a disclaimer* that you may never see any of it in a release product…. So what does Vespa do? The idea is to take precise, too precise, 2d output from CAD applications as an AutoCAD Drawing (.dwg) or Design Web Format (.dwf) export and transform it into an artistic sketch/illustration. I can do that now with illustration/photo software? You can import CAD vector data into programs like Photoshop or CorelDraw/Paint and use their tools with the CAD file as background. I often do this for building elevations and it’s why I was interested. The difference is Vespa “knows” CAD. “Vespa knows CAD”, what does that mean? It does not treat the CAD import as simple geometry. It applies artistic styling to lines, fills and objects in dwg/dwf files based on the CAD objects (lines, blocks, regions etc) and layer definitions. How do you use Vespa with the CAD file? These screen captures from the AU Presentation Video show a 2D CAD export being opened in Vespa. The Style Palette (top left) has object styles which are applied to layers in the Layer Palette (top right) or directly to objects in the file. Line effects and fills are applied based on objects, layers and/or closed boundaries. Blocks can be replaced by objects containing an image or image collections. For example a single tree block can be replaced by a “artistic tree” or “artistic tree collection”. The variations within a collection could be applied randomly, simulating a human factor, or selected for each block insert. These object associations are retained and all the Vespa objects are “Styles” with definitions that can be shared easily. You could create personal styles to match your hand drawing techniques, even scan hand drawn content to incorporate in Vespa styles. The final image, below, shows shadows added to achieve a finished elevation suitable for a proposal. It’s fairly simple but took literally a few minutes to do. That’s all wonderful, what happens when the CAD file changes? This the big difference between Vespa and paint/illustration software. Vespa styles can be shared between files and users. Once established a style template can be applied to other CAD files, other elevations/details in the project, in seconds. If the design changes just apply the style template to new cad exports. This also allows multiple users using the same style template to achieve consistent results and maintain project or company standards. Will Vespa help with concept design? At the time, I lamented the demise of Architectural Studio as it was the only tool in the Autodesk product line that even attempted to address the conceptual stage of the design process (for architecture anyway). 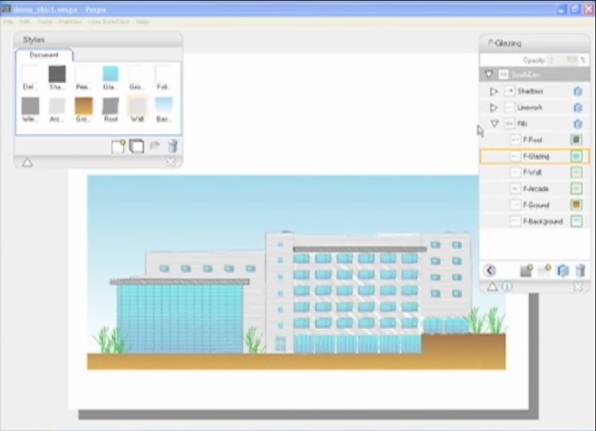 There is a real need for tools to bridge the barrier between CAD and concept sketch/illustration. Photo-real or shade renders from 3D models are wonderful but the precision can be a barrier to communication. Often the client gets the impression the design is “finished” long before it actually is. The downside of hand/image based illustrations is they are slow to produce, individual and not associated to the CAD design. Maybe Vespa, whatever it becomes, will scoot into the void between hand Illustration & CAD Rendering. I could use it, could you? Rachael Taggart of Strategic PR muses on The Attraction of Detraction, asking the question: Why do CAD marketing departments engage in juvenile behavior? As SolidWorks World gets underway in Las Vegas, a competitor [I won’t say who, in order to avoid giving them the free publicity they crave] is setting up a marketing stunt in a parking lot behind the Imperial Palace. With the WaveLoch device (whatever that is), they hope to attract the attention of customers attending SolidWorks World. Portland, OR â€“ January 18, 2006 â€“ ICADSales.com has added the ICADSales.com Bonus Pak with every ProgeCAD 2006 Professional CAD software purchase. The ICADSales.com Bonus Pak includes over 4000 AutoLISPÂ® routines, blocks for various industries, hatch patterns, font shape files and compiled fonts for IntelliCAD. ProgeCAD 2006 Professional, based on the IntelliCAD 6.1 CAD engine, includes a library manager for discipline specific symbols, ACIS solid modeling, raster image support, rendering, and a unique set of tools that only ProgeSOFT offers. ProgeCAD software supports the DWG design file format, from version 2.6 through 2006, plus support for AutoCADÂ® menus, scripts, blocks, AutoLISPÂ®, SDS C++ Programming, and VBA for IntelliCAD. 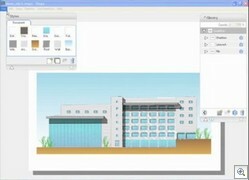 A free evaluation of the latest version of ProgeCAD 2006 Professional is available at www.icadsales.com. 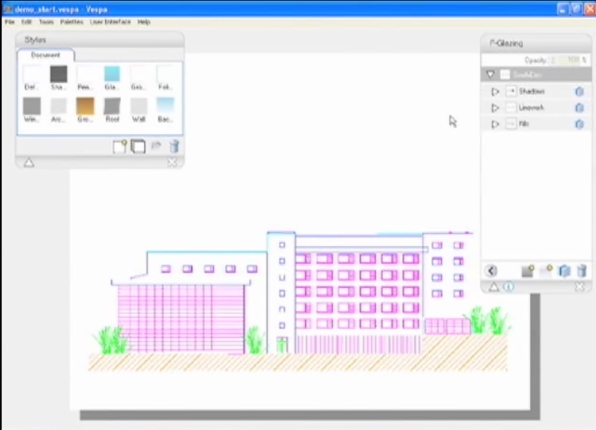 ICADSales.com also offers 30 day evaluation copies of ProgeARC 2006, architectural design software based on the ArchT design engine, ProgeMEC 2006, for mechanical design tasks, and the ProgeCAD DWG Viewer, which allows both viewing and printing of DWG files. An updated solution for aligning objects in AutoCAD 2006…. 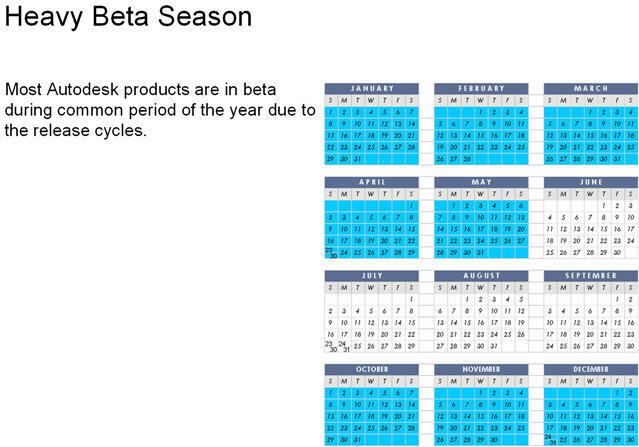 It is beginning to be the height of Autodesk product beta testing season. Help shape the future of Autodesk products by becoming active as a customer in the future product beta test. Who defines what the next Autodesk products will have in the next version? The customers do and Autodesk listens. Be heard and get involved in shaping the future of Autodesk products. What you see in our products today are a direct reflection of your involvement with support calls, e-mails, AU, AUGI, discussion group participation, usability sessions, beta testing, surveys, and many more methods. Beta sites have the greatest opportunity to influence the final implementation of features and to identify critical problems with the best chance of early resolution. The goals of each beta release are to collect your assessment of the overall feature set, to get your opinion on the implementation of each feature, and to begin identifying bugs which occur in your use of the product and in your environment. Customers are selected to become Beta Sites based upon their interest, willingness, and ability to provide timely information. Beta Sites provide product feedback throughout the development process until the final release. All customer problems, issues, enhancement requests, and suggestions are reported to the Beta Team and escalated to the appropriate development teams. Regular contact with Autodesk via bug reports, weekly summaries, and questionnaires is expected. Beta Sites are also selected on the basis of past participation and sign up information. Each beta program varies, but at a minimum, we expect you to spend as much time as possible in your normal production environment with the software to expose defects. Along the way, we also expect you to send in your comments about the software as well as any wish list items you may have. Please note beta version programs and files should not to be used without careful consideration that these are unreleased beta products and are not fully supported and may contain software defects. The main purpose for posting them is to find the defects and have them reported so that they can be fixed in the final released version. As with any beta software always back up your data and previous files and exercise caution when in a production environment. A private online discussion group available in both web and NNTP. Getting an advance look at new software. The delight in discovering bugs that we didn’t catch in our in-house testing. We sometimes offer rewards like free products, free hardware, digital camera, new computers, free AU travel and passes, and MP3 players and best of all knowing that you were getting your feedback in and being part of the extended product team. Most important, it’s your chance to contribute to the product’s design and features! Most beta projects require the agreement to a Beta Site Agreement which protects both your and Autodesk private and confidential information. During beta no details may be discussed publicly. Please no posting of beta or feedback project details, questions, rumors, or support requests in the public and that includes public web sites, or public discussion groups. This is a very important requirement to keep betas private and only discussed in these private forums or with Autodesk employees. We will clearly announce to you when the date for a beta is reached and you can then begin discussing the next release of the product you are beta testing. This is for customers or potential customers. Resellers, Employees and ADN developers have alternate channels to get beta or preview products. Make sure to complete the sign up profile accurately and do not use a free email account use your business or personal email so we know who you are. We do not sell your email or spam you.